You needn't be an extrasence to control your computer remotely. You even needn't buy remote control device. All you need is your mobile phone and our program. PhoRC (Phone Remote Control) allows to control computer software from the keypad of your mobile phone. Pay attention - nothing needs to be installed to the mobile phone! Just link phone and computer by Bluetooth and after short tuning of the program it will act as a remote control device. All other phone features will be accessible as usual. PhoRC allows to control computer software that support keyboard control. 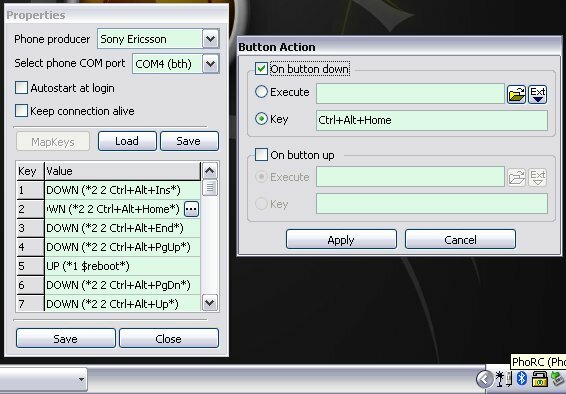 You need just setup the accordane between keys of the phone and key combinations of the program. The most simple and effective usage is - remote presentations control and control of audio-video players. nothing needs to be installed to the mobile phone. operation range: 10m (Bluetooth limitation). You can read additional information about PhoRC. You can download the latest version of PhoRC (version 1.2.4) here. PhoRC is shareware program. Registration price is $12. You can use one of the following links to register PhoRC. Or email the author to get instructions for direct registration without any intermediate service.